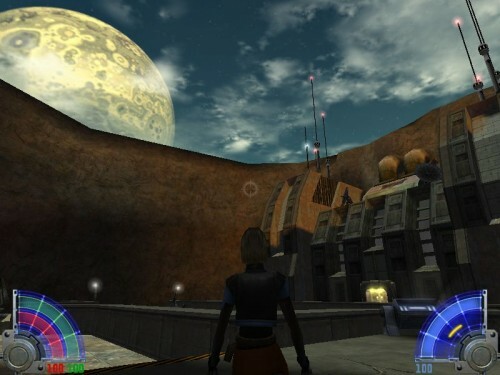 About six months after the release of Jedi Knight II, there was much speculation of a possible expansion, fueled by rumors and folks with direct connections to Raven Software and LucasArts saying that ‘fans of Jedi Knight II will be very happy in November’. Well, November came and went, but by January it was clear that something was coming, we just weren’t sure if it would be an expansion or a sequel. By E3 of 2003 we were finally fully shown what was coming: a sequel to Jedi Knight II. 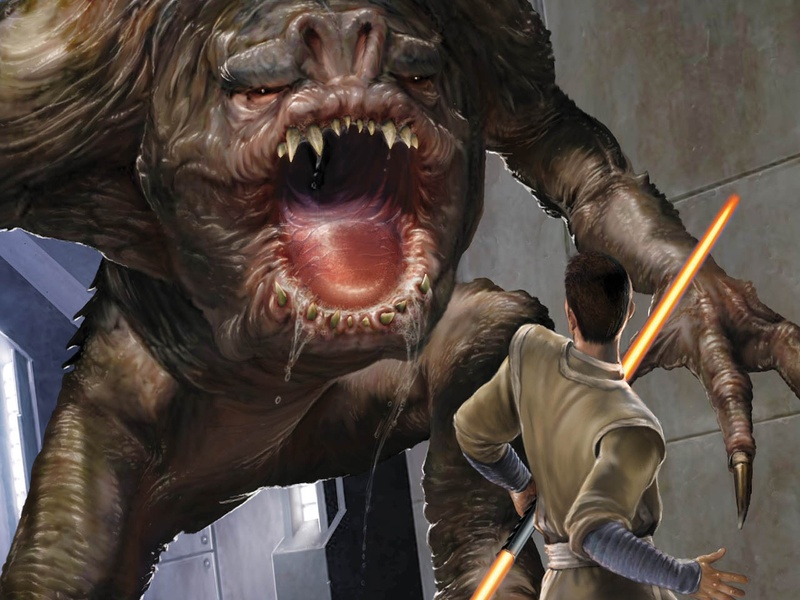 In fact – the first two images I used were concept art and a wallpaper released in the lead-up to the game, and you can see how the Rancor translated to an in-game presence in another screen later. The game would use the same developer working with the same engine, but promised to advance the story and the technical aspects we already loved, as well as bring us back to many things we all missed about the original Jedi Knight. Many of us were skeptical. The thought that sending Kyle back to a low-level character yet again would seem contrived made sense, but the overall description and time-line made us wonder if this was really an expansion that was twisted around a bit so they could get more money by releasing it as a sequel. 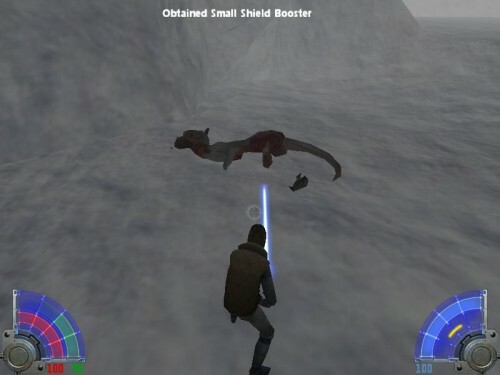 By that time, most gamers would expect that from LucasArts. 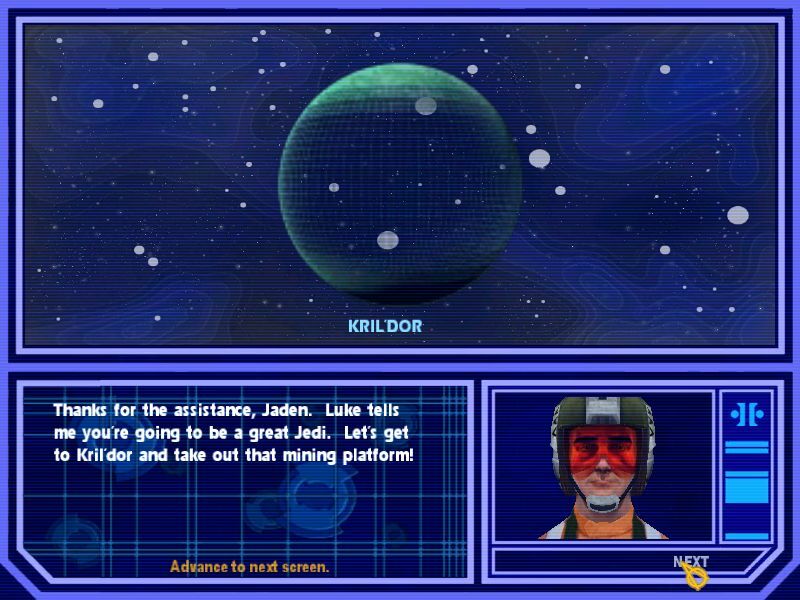 The story of Jedi Academy takes the focus away from Kyle Katarn and on to an incoming student to the Academy named Jaden Korr. The name is generic, allowing the player to choose male or female characters, as well as some other customization details regarding your character’s appearance and clothing as well as lightsaber hilt and blade color. Jaden meets another student – Rosh Penin – on the Academy shuttle, and we see Rosh as insecure, immature, and generally over-bearing. The ‘opening crawl’ tells us that Jaden “is en route to the Academy after achieving the impossible: creating a lightsaber without any formal Jedi training…” Even the most ardent of Jedi Knight fans are likely uttering an ‘errm … what ?’ at that phrase. Thirty years of Star Wars Jedi lore has told us that creating a lightsaber is a culmination of the training designed to help a Force-sensitive individual learn to harness and control the flow of the Force energy around and through them. To have some kid from nowhere suddenly creating a lightsaber by pure happenstance…well, let’s just say that for many our credulity was already being strained. The choice of gender is interesting in a couple of ways. 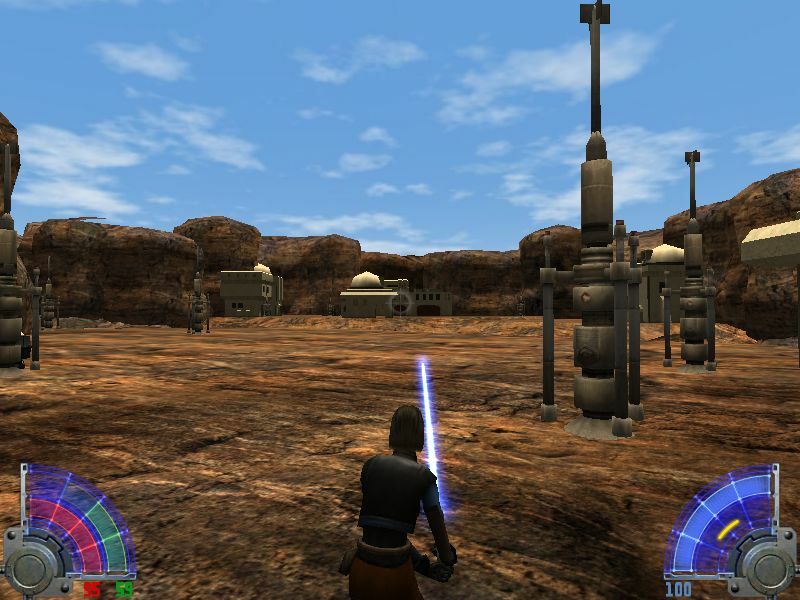 Since the game starts you off as a fledgling Jedi student who is in possession of a lightsaber, there is little FPS gameplay, and therefore you actually get to see your character and his or her outfit / appearance / lightsaber throughout the game. The other thing is that your gender choice impacts the voice acting (obviously), and since there is loads of dialogue throughout the game, it actually does make a difference. The male Jaden is voiced by Philip Tanzini, and the female by Jennifer Hale. I’m sure that Mr. Tanzini is a fine voice actor, but between his version of Jaden and Rosh the opening sections and tutorial quickly becoming more annoying than fun. Therefore after my first time through I have only ever used a female Jaden. Many will recognize the name Jennifer Hale as Bastilla Shan from Star Wars Knights of the Old Republic. But she is also Lady Aribeth from Neverwinter Nights, Fall-From-Grace in Planescape: Torment, Samus Aran from Metroid Prime, female Commander Shepard from the Mass Effect series, and a host of other characters in popular games, cartoons and other voice-over work. She is an outstanding voice actor who really brings Jaden to life in an excellent way. 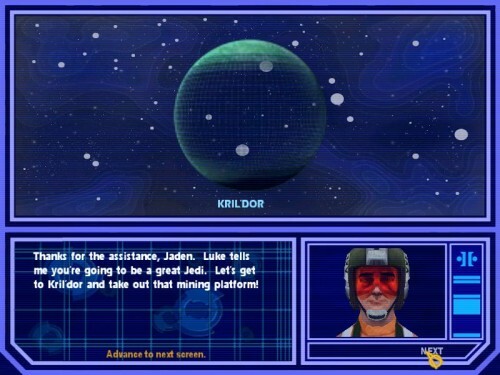 I pretty much always played male characters when given a choice until Jaden in Jedi Academy. Now I will tend to play both genders to fully explore the writing and other content. 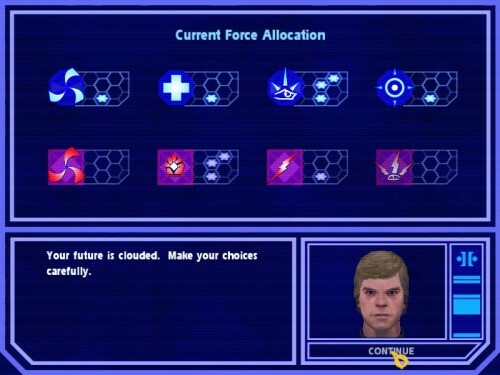 Once you complete the tutorial sections you get to see the two major items that are new compared to Jedi Knight II: mission selection and Force Power selection. You also get to choose your starting weapons for a mission, but since you have unlimited carry capacity – and you will use a lightsaber 90% of the time – it really doesn’t matter much. From the very start of the main game, you are assigned as a student of Kyle Katarn, and since he believes that the best for you is to learn by doing, you get to choose which mission to pursue. The game arranges missions in tiers, with five missions per tier and three tiers. You only need to complete four of the five missions in order to advance to the next ‘main plot mission’, which gives you an option to either do everything (and get an extra force allocation point) or move more quickly through the game. Also at the beginning of each mission you get to allocate one force ‘star’ to the Force Power of your choice. The ‘core’ powers (Push, Pull, Speed, Jump, Offense, Defense, Sense, and Lightsaber Throw) all advance naturally as your progress through the story, but there are eight other powers split evenly between ‘Light’ and ‘Dark’ that you can select to advance. The Light powers include Heal, Absorb, Protect, and Mind Trick; the Dark powers include Drain, Grip, Lightning and Rage. 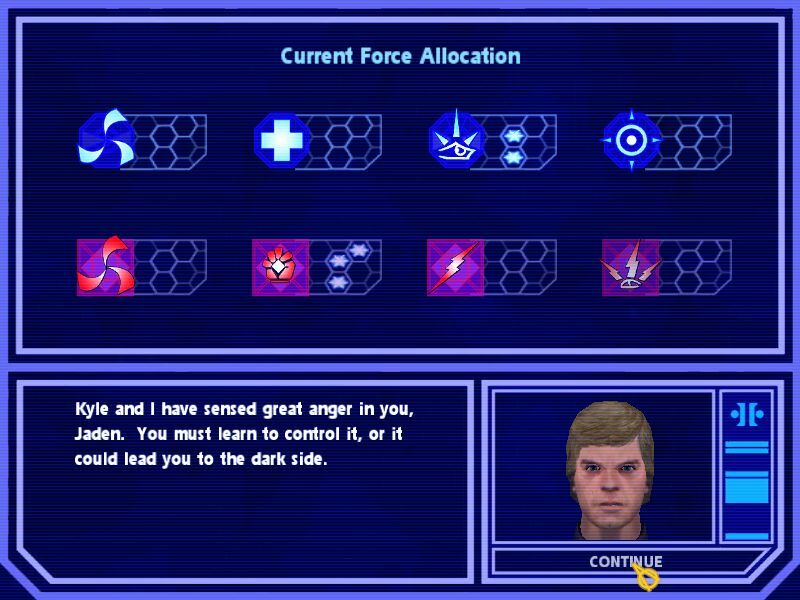 All of the Force Powers are useful in one way or another, but your choices impact the way that Luke and Kyle deal with you and ultimately have a minor impact in the events leading up to the major choice you face in the late section of the game. The other major departure from the original Jedi Knight is that each power is very powerful and each level is a dramatic step up. 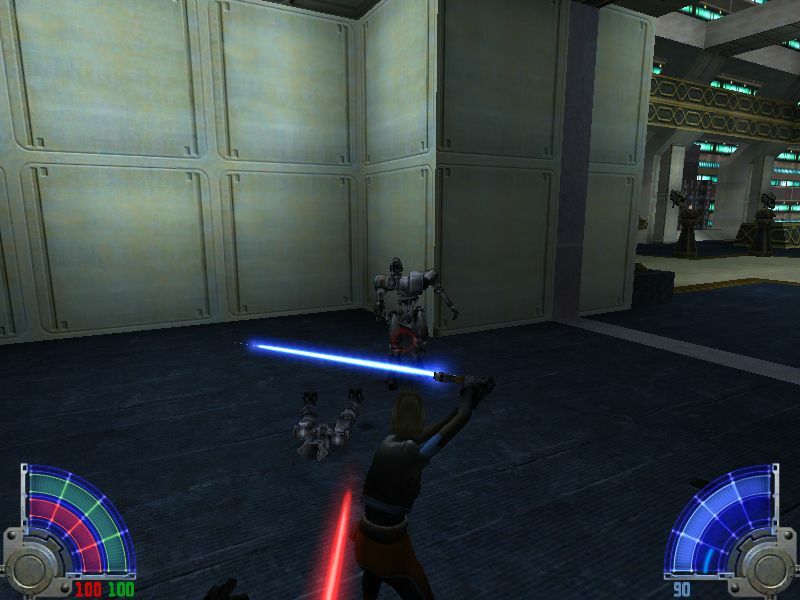 So while maximized lightning in the original Jedi Knight was a single line that felt like static electricity, in Jedi Academy you can take down a small crowd with level 3 Lightning. Each non-story mission takes place in some place that has been explored either in the movies or elsewhere in one of the popular ‘Expanded Universe’ books. Some places such as Nar Shadaa you have seen before in other Jedi Knight games, but there are plenty of new locations such as Corellia and Coruscant as well. 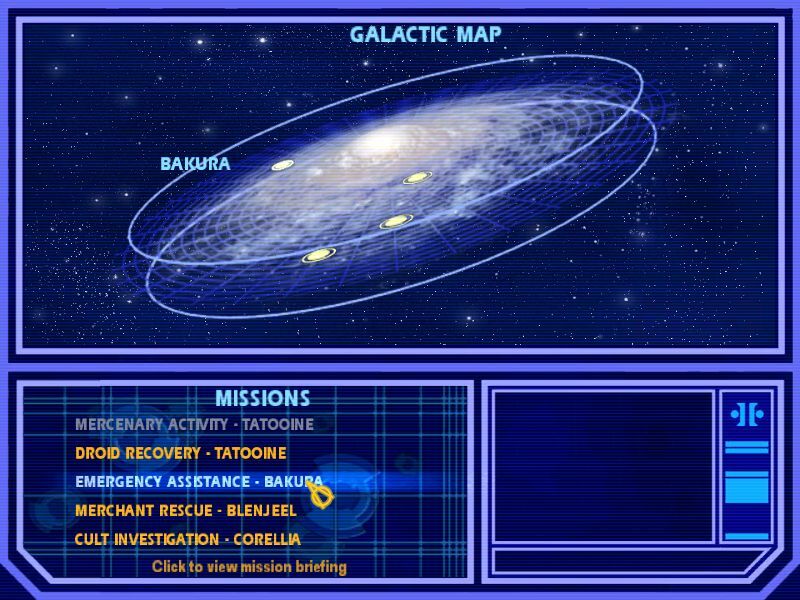 Missions also vary in terms of content, focus, and length, and feel in many ways like the classic level-mission structures from the classic ‘level designer driven game’ days. For example, the ‘Merchant Rescue’ mission to Blenjeel is combat-free and requires you to think your way through and depend upon your Force Powers; the Tram Mission on Corellia is a high-speed chase at dizzying heights; and Tatooine will show you some of the ‘droids you aren’t looking for’. 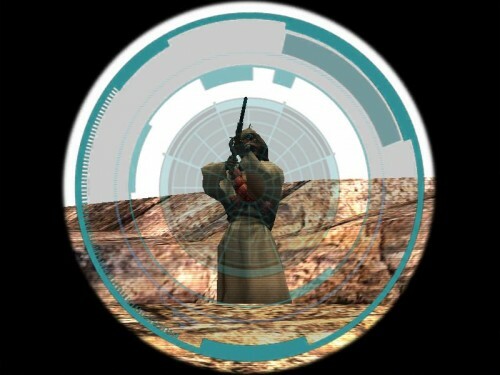 As each mission has an individual feel, they also vary in terms of quality and replayability. Once you have completed four missions, you get the choice to either complete the final mission for that tier or head back to the academy to further the story. The story missions don’t let you upgrade your Force Powers, instead focusing on advancing the overarching plot and allowing you to further yourself as a Jedi. This happens in a couple ways: after each story mission your ‘core’ Force abilities level up, which is a huge advantage as you progress. You also get to select a new lightsaber style as you advance. You start off with the basic ‘balanced’ style, but a new rank in ‘Lightsaber Offense’ means the ability to choose a second style – either Fast or Strong. 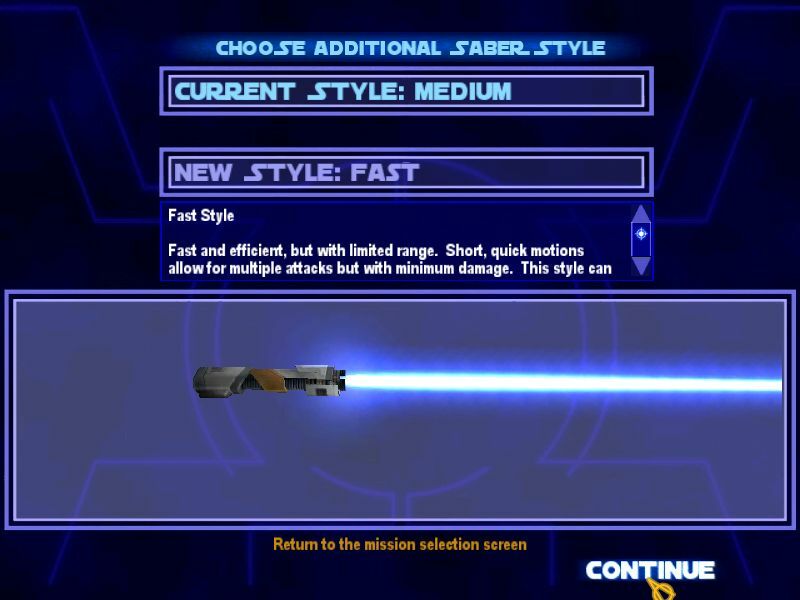 Later in the game you get to choose another style, this time either the final single-blade style, or your choice of dual lightsabers (e.g. : Anakin vs. Dooku in Attack of the Clones) or a double-bladed lightsaber (e.g. Darth Maul). Through the years I have tried everything, but my personal favorite is to choose the Fast style and then dual lightsabers. Eventually you will come to a confrontation that makes it clear you are entering the ‘end game’, and have to make the ultimate choice between Light and Darkness. If you choose the Light path – and the game makes it insultingly obvious – you will join with Luke and Kyle and other Jedi and head to the traditional Sith stronghold of Korriban to work towards the game’s final battle. 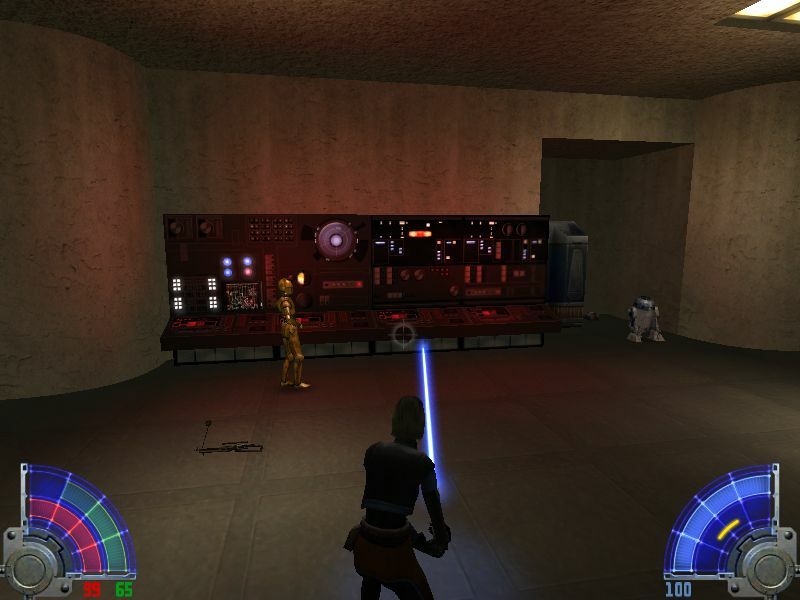 However, if you choose a certain act you will turn to the dark side of the Force regardless of any other decisions you have made in the game. From that moment on you are an enemy to all Jedi and New Republic forces…but that doesn’t mean that the Imperial Remnant troops or the Disciples of Ragnos are suddenly your friends either. The Dark path is much harder to play because from that moment on everyone is against you. 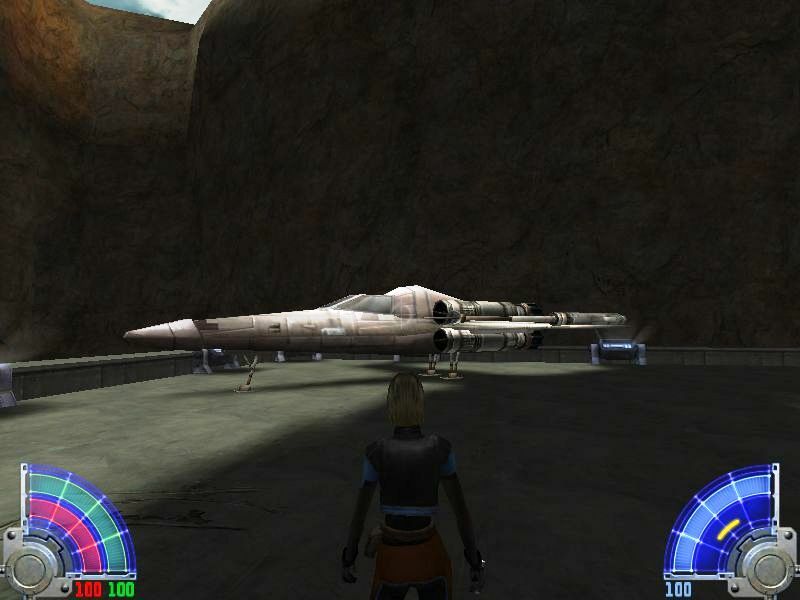 When I first played I was able to justify this to an extent based on some of the EU stories, but ultimately it fails on one basic thing: the entirety of Star Wars lore is predicated on tales of struggle, failure and redemption. Even the act that makes you choose Light or Dark is a classic redemption of a fallen Jedi. But ultimately I understand that the developers wanted to allow you to choose Light or Dark and have that choice make a difference, and in that regard it succeeds. The multiplayer is largely an enhanced version of Jedi Knight II, and as such pretty much the entire community jumped to it soon after release. 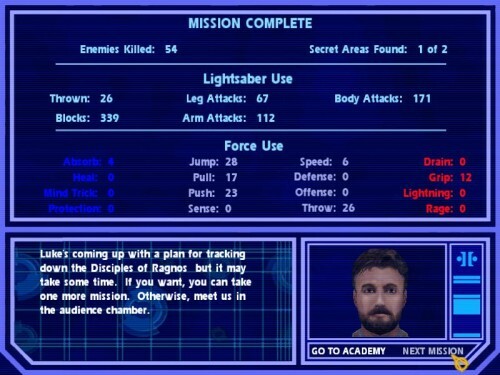 Sadly my favorite mode – Jedi Master – was cut from the game, but the bottom line is that lightsaber combat is better in Jedi Academy than in Jedi Knight II. Checking out the online game now I was reminded of the ‘honor system’ silliness that pervaded the game upon release. Basically Jedi were supposed to bow to one another prior to a dual and then basically treat each other respectfully. While there is a place for such things and that made for interesting matches, for too many it became an edict that was forced upon others and threatened to destroy the online community for a time. 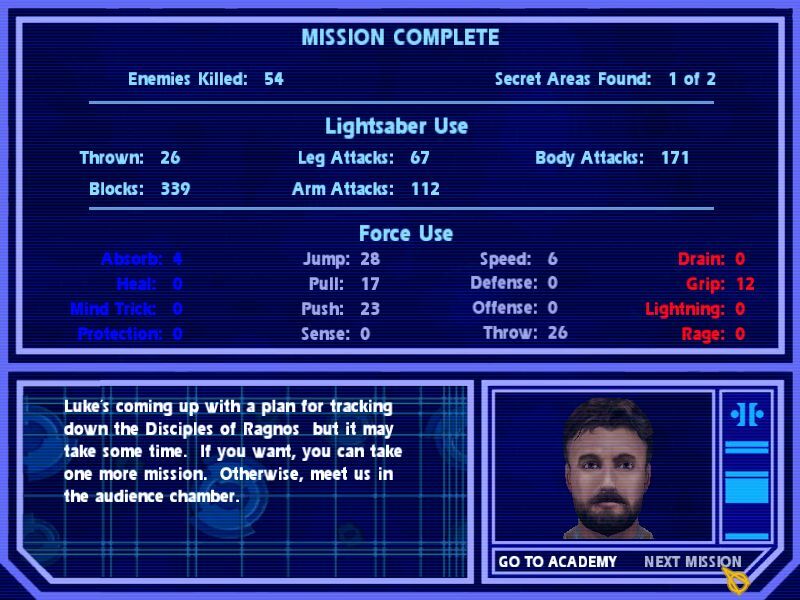 Jedi Academy took me about 20 hours to complete the first time through, but since then it typically takes me ~15 hours. It is another game I have played many times, and I estimate I have run through the entire game at least 15 times. 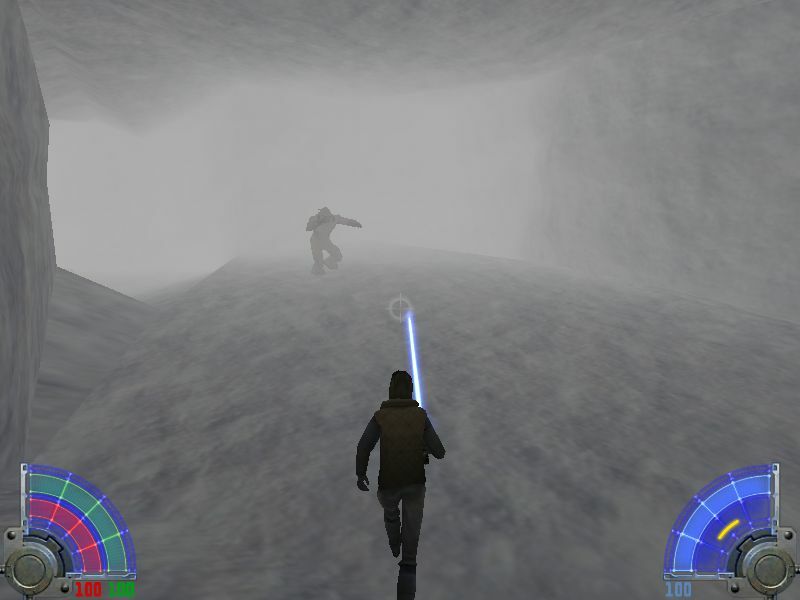 I am of two minds about the game: on the one hand it is my least favorite entry in the whole Kyle Katarn series, but on the other hand it is the best ‘jedi combat’ game ever made. It is my least favorite because the plot is trite and amateurish, the voice acting is grating at times, and perhaps worst of all the game hints at greatness in many ways but fails to deliver. You get what seem to be choices with consequences as Luke and Kyle address how you have selected and used Force Powers, but ultimately everything comes down to a ‘light switch choice’. 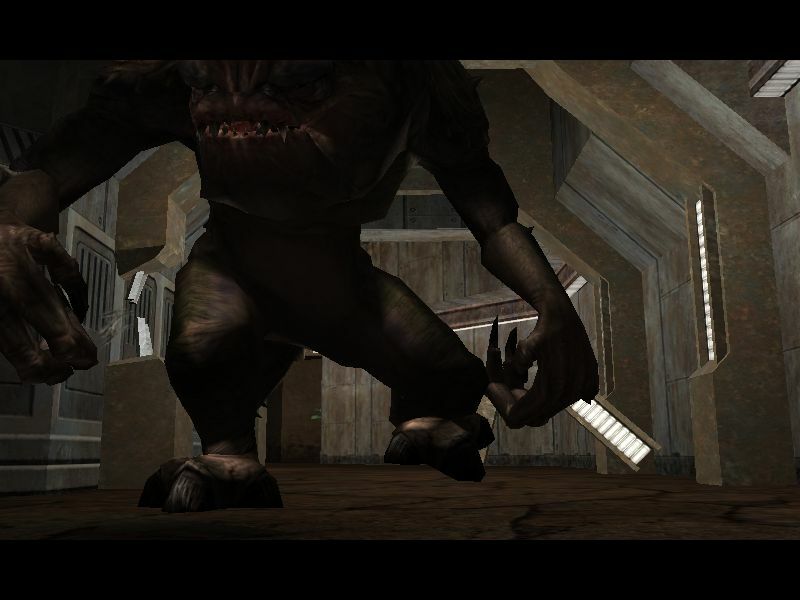 And your ‘ultimate enemy’…well, that is something that seems more fitting of an expansion than a true sequel. Yet from the very start of the game it is clear that Raven Software took all of the feedback and commentary on their combat system and worked on optimizing it. Motion is smoother and the combat moves are more fluid. The progression from low-to-high level feels more natural as well. The game remains challenging throughout by introducing more and more powerful opponents, but base Stormtroopers cease being a challenge very early on. Conclusion: Jedi Academy has aged very well in terms of the combat system, but the deficiencies in terms of the story are even more glaring now than when the game was released. 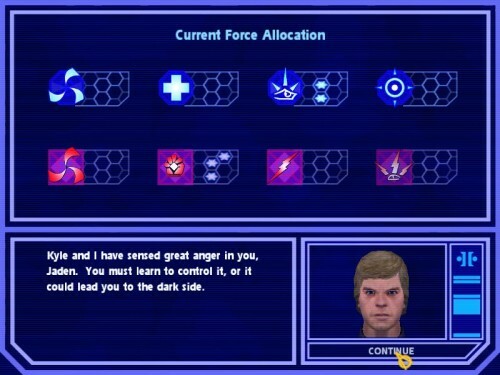 Yet what makes it work well is that Jedi Academy hearkens back to the original Jedi Knight by offering user choices for Force Powers – and one-ups the original with truly excellent powers. 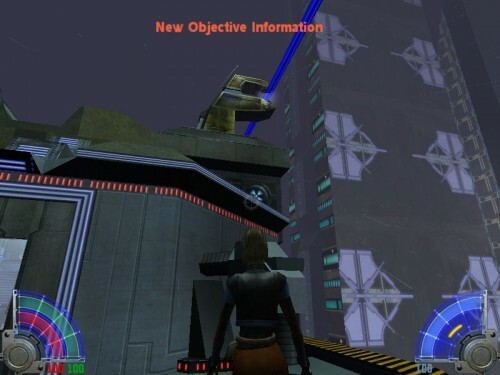 It also looks backwards with the use of very designer-centric mission structures, and gives players a sense of control by allowing you to do the missions in any order. 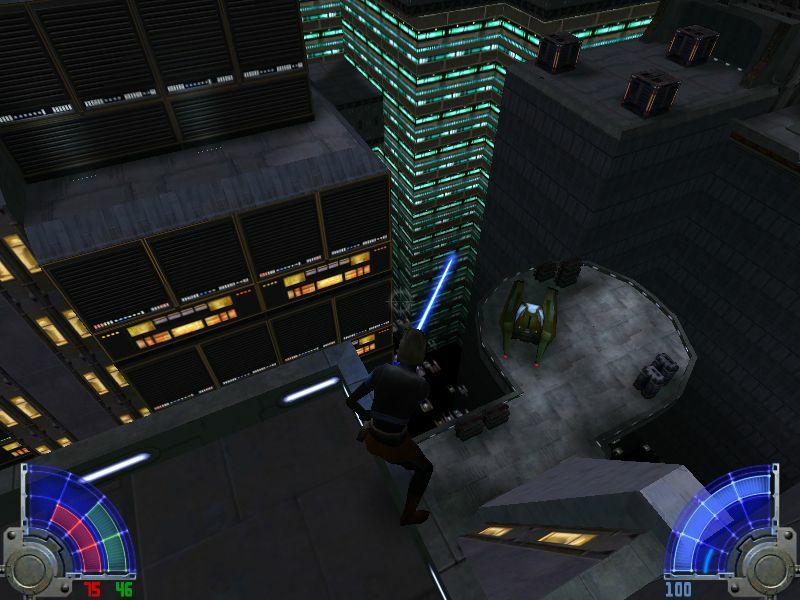 Finally, the game provides loads of fan service: tons of EU and movie-based locations are explored, and the ability to wield dual lightsabers or a double-bladed saber are all excellent bonuses. Jedi Academy is available for $10, lasts at least 15 hours for the single player campaign, and will run on nearly any hardware available, making it an easy choice for Star Wars fans or anyone looking for a thrilling story-based shooter game with just about the best melee combat engine ever made. 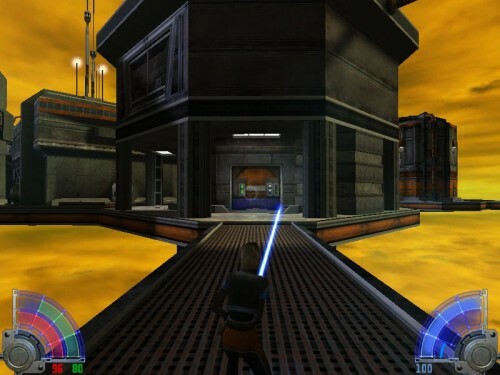 RetroGamer Perspective: Star Wars Jedi Academy falls into the category between new and old – in console terms it would clearly be ‘last gen’ or even ‘last-last-gen’, but it is recent enough that it contains relevant references to the Star Wars prequels. Since there has been nothing new in the same game type since Jedi Academy, it remains the benchmark for lightsaber combat – when The Force Unleashed came to Mac & PC late in 2009 folks wondered how the combat would compare to Jedi Academy (sadly it didn’t). 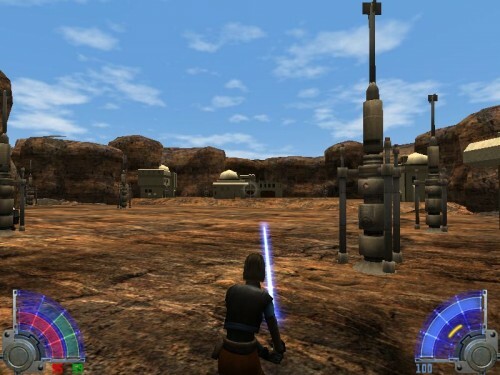 So instead of ‘retro’ I would say that Jedi Academy is a fairly modern game that will run on nearly all recent hardware. 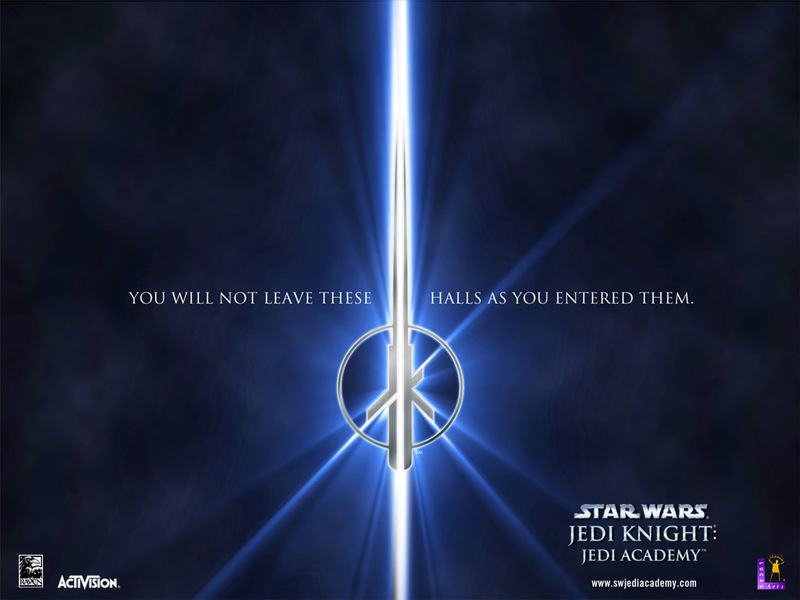 See my reviews of the original Star Wars Jedi Knight, the Mysteries of the Sith expansion, and the Jedi Knight II sequel!